For the past 30 years, the Chess’n Math Association has been giving chess lessons in Canadian elementary schools both as an extra-curricular and regular classroom activity. Year after year, the Association has built a well-deserved reputation as being Canada’s National Scholastic Chess Organisation. A choice of over 150 qualified, competent and trained instructors who adapt to your school’s needs. Whether your students are at the pre-kindergarten level or in Grade 8, we have an instructor for each group. Many of our instructors teach in the same school year after year. They know how to interact with children. Nearly a third of our instructors have been working for the Chess’n Math Association for over ten years. Many of our instructors are national and international caliber chess players. Constant monitoring by the Association’s team. We are here from 9:00 to 5:00 to answer all your questions. Our goal is the highest possible client satisfaction..
A program developed by our best instructors over the years. Our expertise is teaching the basics of chess in a structured, ordered way. At the end of each session each student will receive a certificate attesting to their level of achievement. An active and motivational team.. In addition to giving chess lessons with reputable and qualified instructors, we also offer many complementary activities: tournaments, a school-wide rating system, a children’s chess magazine, day camps, and much more! As the Chess’n Math Association is a non-profit organization, all the profits are reinvested to improve our services in the schools. to more than 10,000 children per week! Chess'n Math in your school? 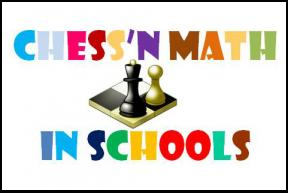 Chess'n Math has raised educational scores throughout Canada! It's a fun sport, that makes your child brilliant at the same time, and teaches them life-skills!! We are Canada's biggest and most trusted chess and math provider, the highest quality teaching, at the lowest price! Yes, we are almost 40% cheaper than the market, charge no taxes, and issue tax receipts eligible for a tax credit! In effect, your child receives top-class instruction for almost nothing! To find out about our course reimbursement policies, please contact our regional office (Montreal, Ottawa and Toronto) for your province applicable rules. Administrative fees may also apply. We run daytime, lunch-hour and after-school programs in schools and daycares throughout the Greater Toronto, Montreal and Ottawa areas. We handle all the registration processes to make starting a chess-program at your school absolutely hands-free! The game of chess is a perfect fit with a program that has these types of objectives. Chess is problem-solving from start to finish. It forces you to look ahead and anticipate. Skills we all need to succeed in life. Schools using the Challenging Math program are scoring far better in math than those using other programs approved by the Ministry of Education. The province of Quebec, where the program was first introduced, has the best math marks in Canada and Canada scores better than the U.S.A. on international mathematics exams. In the province of New Brunswick, Challenging Mathematics was introduced into all the French language elementary schools. Now, a number of years later, the French sector in New Brunswick is scoring much better in math than their English counterparts from the same province. I do not want people to conclude from this that chess is the only reason for this. I believe it is the whole approach of the program and certainly the game of chess is part of that. Chess is introduced in the second half of grade 2 (7 years old) within the Challenging Math program and youngsters continue learning the game right through to grade 6 (11 years old).